Sandwiched between historic Boston and fashionable New York City, Hartford, Connecticut, is the often overlooked and underappreciated middle child of Northeast cities. Yet, this riverside capital that bloomed with the development of America's insurance industry has enough sophistication to entertain and none of the usual hassles you'd equate with urban escapes. With a happening food scene, first-class cultural attractions and an up-and-coming riverfront development, Hartford is an increasingly enticing destination. Best of all, when you choose Hartford for a long weekend away, the ease of coming and going opens up a world of recreational opportunities, from hiking and river tubing to historic tours and casino gaming. Although most downtown Hartford hotels offer fairly standard, business-class lodging, all are conveniently located within the compact city center. The Hilton Hartford — with an indoor pool and fitness center — is a particularly good choice. The Residence Inn, although designed for long-term stays, is a suitable option for those who want to feel right at home in Hartford. The Hartford Marriott Downtown is attached to the Connecticut Convention Center and has all of the dining and entertainment enticements of the Front Street district at its doorstep. Each of these hotels is located near a stop on the route of the Hartford dash Shuttle, a complimentary downtown shuttle bus service, which makes it easy for visitors to tour the city on weekdays, as well as on weekends when there is an event in town. When a hearty breakfast is in order, locals know precisely where to go—Mo's Midtown just off of Farmington Avenue in the West End. You'll find thick, buttery pancakes, mounds of hash browns fresh from the griddle and arguably the best omelets in town. After such a feast, you'll be fueled up to discover the city that serves as the seat of government for America's third smallest state. Although you might feel like walking after ingesting a calorie and carbohydrate laden meal at Mo's, it's a bit too far to make it back downtown by foot, so hop in the car and drive by Bushnell Park and the glittering, dome-topped 1878 State Capitol Building. Designed in High Victorian Gothic style, it is one of the city's most prominent architectural features and a National Historic Landmark. The statehouse is the perfect starting point for a walking tour of the city. 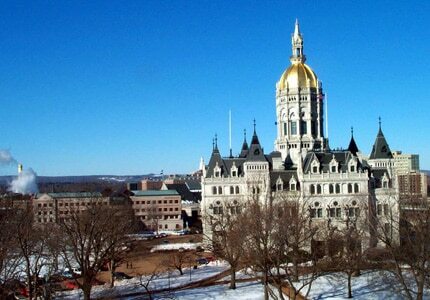 If you choose to venture inside, complimentary weekday guided tours provide insight into Connecticut's storied past and an opportunity to view government in action when the legislature is in session. Bushnell Park, the nation's oldest public park, also doubles as the capitol's front lawn. This oasis of green, designed by Jacob Weidenmann, contains its fair share of surprises. At the northwest corner of the park, the Soldiers and Sailors Memorial Arch is a distinctive, brownstone monument that honors the 4,000 Hartford residents who served in the Civil War, including 128 African-American soldiers and 400 locals, who gave their lives for the preservation of the Union. In the southeastern corner of Bushnell Park, view changing exhibits of works by Connecticut artists inside the Pump House Gallery. The best treat of all is the centrally situated Bushnell Park Carousel, a meticulously restored antique merry-go-round that dates to1914. For just a dollar, riders of any age can choose a mount and gallop off as the Wurlitzer 153 band organ plays on. The carousel is scheduled to reopen in the spring of 2015 following pavilion renovations that will allow it to operate year-round. From the northeast corner of Bushnell Park, walk north one block on Trumbull Street and take a right on Pearl Street. At the intersection of Pearl and Main Streets, you'll find Hartford's Old State House. This predecessor to the current capitol is one of the oldest state houses in the nation and was the site of the signing of the country's first written constitution. Designed by noted architect Charles Bulfinch and completed in 1796, the Old State House is now a museum of history and curiosities that you can explore at your leisure for a modest admission fee: only $6 for adults and $3 for kids ages 6-17. As you continue to walk along Pearl Street toward Constitution Plaza and Hartford's riverfront, be sure to look south for the onion-shaped, blue-toned dome of the original Colt Firearms Factory. Nestled on the banks of the Connecticut River, the factory was re-built by Colt's wife, Elizabeth, in 1864, following a devastating fire. After her husband died in 1862, Elizabeth Colt became one of the most powerful women of America's industrial era. Congress has approved funding to transform this landmark into Coltsville National Historical Park. Now that you've familiarized yourself with the city and worked up an appetite, it's time to venture to Hartford's picturesque West End. Cruising along the neighborhood's tree-lined, sleepy little streets is a treat — nearly 70 percent of this side of the city is included within the National Register of Historic Districts. You won't find a more scenic spot for lunch than the Pond House Café in Elizabeth Park. Munch on organic veggie salads, creative sandwich selections and hearty hot entrées inside this bright and inviting restaurant overlooking the park's duck pond. We won't tell if you sneak a crumb or two out for the feathered freeloaders who flock to America's oldest municipal rose garden. Elizabeth Park boasts more than 15,000 rose bushes arrayed in beds, on arches and along fences. More than 800 varieties of roses — heirloom and new — bloom each year at this magnificent spot, which is at its peak in June. The park's herb, perennial and rock gardens, along with 100-year-old greenhouses, ensure there is usually something in bloom. Once you've literally stopped and smelled the roses, you'll want to tour two landmark West End homes. Literary legends Samuel Clemens and Harriet Beecher Stowe were neighbors at Nook Farm during the late 19th century. Clemens, better known as Mark Twain, was at the pinnacle of his career—he published seven novels, including "Tom Sawyer" and "Huckleberry Finn," between 1874 and 1891 while residing in the 19-room Victorian mansion with Tiffany appointments. 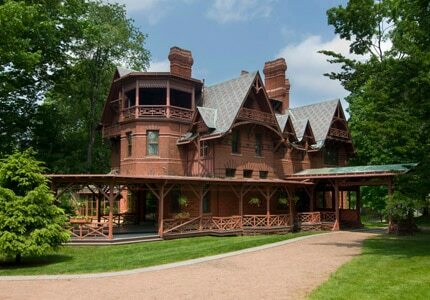 The Mark Twain House and Museum showcases Hartford's most famous former resident and provides perspective on his work, his genius and the triumphs and tragedies of his life. Visitors particularly love the humorous Twain quotations that grace the museum's walls. Stowe's fame peaked prior to her Hartford days with the publication in 1852 of the anti-slavery novel, "Uncle Tom's Cabin," but when you visit the Harriet Beecher Stowe Center and tour her Victorian cottage (adjacent to the Twain house), you'll learn that her 51-year writing career was actually remarkably diverse. If souvenir shopping is on your agenda, be sure to allow time to browse in the museum gift shops at both historic sites. Nearby West Hartford Center, a short jog west on Farmington Avenue, is also a prime destination for shoppers with clothing boutiques, gourmet food purveyors, jewelers and a toy shop within an easy-to-walk radius. Many of the curbside coffee shops and restaurants offer café-style outdoor seating, so grab a steamy cappuccino and watch the world go by. You might also want to linger for the lively happy hour or even dinner at Max's Oyster Bar, part of the award-winning Max Restaurant Group. There is a diverse, locally focused menu that runs from classic baked oysters and steamer clams to paella, pan-roasted lobster and chop house steaks. Just a short walk away, you'll find Blue Back Square, the area's hippest shopping and dining destination. Part faux-small town village center, part modern promenade, the square contains all the amenities a consumer could possibly, well, consume — chain retailers like Barnes & Noble and REI, chic indie boutiques, a state-of-the-art health club and a movie theater as well as myriad eateries. * Hartford State Capitol image courtesy of Connecticut General Assembly and the League of Women Voters of Connecticut Education Fund, Inc./ Mark Twain House image courtesy of the Hartford official website.